Façade of addition has openable "shutters"
When the Landmarks Preservation Commission indicated in October, 2006 (see The City Review article) it did not like Sir Norman Foster's design for a curved, reflective-glass, 22-story addition to the five-story former Parke-Bernet Building at 980 Madison Avenue that Aby Rosen wanted to erect it came as something of a surprise since the architect is one of the most famous in the world and the developer owns Lever House and the Seagram Building on Park Avenue, two of the city's, and the world's, most famous icons of modern high-rise architecture. That sleek proposal was the boldest on the avenue, and the Upper East Side, since Marcel Breuer's Brutalist design for the Whitney Museum of American Art, one block south on the avenue. It would have added 18 condominium apartments on 22 floors and a large rooftop sculpture garden to the low-rise building as well as restoring the much modified low-rise building to its 1950 original design by Walker & Poor to house the Parke-Bernet auction house as well as a Schrafft's restaurant. In June, 2008, the architect and the developer finally submitted a revised design that adds 5 more apartments but dramatically lowers the height of the addition to 5 floors, now stretched entirely over the roof of the existing building, which will still be restored "fully." Whereas the initial design would have had quite a few apartments with spectacular views in most directions, the revised design would have no skyline vistas. The new design uses only 152,000 square feet of the 203,000 square feet permitted under existing zoning and will seek Gold LEED certification as an environmentally friendly structure. The earlier design did not conform to existing regulations but the second design can be built "as-of-right." In making its presentation of the revised design, Brandon Haw of Foster + Partners emphasized that neighborhood and preservationist concerns about the height of the original proposal, which was lower than the Hotel Carlyle directly across the avenue, had definitely been heeded. Interestingly, the new design significantly reduces the blocking of southern views from the former Mark Hotel directly across 77th Street that is currently being partially converted to residential condominiums, but the presentation made no comment on such developer largesse towards a competing project. But the developer's sacrifice of views and building bulk were not the only surprises. The new design is clad in louvers, perhaps champagne-colored, spaced three inches apart horizontally, in strong contrast, at least in the presentation renderings, to the limestone-clad exterior of the original building. An unusual aspect of the louvers is that part of them open, like shutters, and can also be "folded" together like an accordion to create a large opening. An unusual aspect of the louvers is that part of them open, like shutters, and can also be "folded" together like an accordion to create a large opening. The "shutters" can also be opened at any angle. 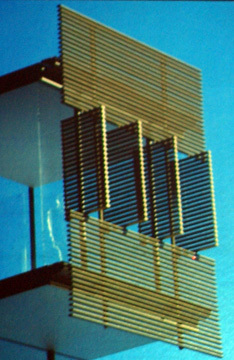 The louvered façade of the "addition" is actually only a screen in front of glazing and as such appears to a certain extent as a solid mass that some preservationists and critical neighbors said "overwhelms" the base, but unlike Renzo Piano's battleship grey screen at his new skyscraper on Eighth Avenue for The New York Times across from the Port Authority of New York and New Jersey's bus terminal, Mr. Foster's screen has moveable parts, perhaps a nostalgic throwback to his spectacular proposal in 1978 for a mixed-use tower adjacent to the Whitney Museum of American Art that had a slanted-glass base as expansion for the museum but a sheer setback tower with interchangeable black-metal panels with a variety of geometic cutouts for windows, a stunning and sensational design, one of Foster's finest, that should still be built. The landmarks committee of Community Board 8 voted unanimously June 16, 2008 to endorse the restoration part of the Rosen proposal, which was to be the next day at the Landmarks Preservation Commission and considered the day afterwards at a "full" meeting of Community Board 8. The board's landmark committee voted 7 to 2, however, to oppose the granting of a certificate of appropriates by the landmarks commission because it felt the addition was inappropriate for the historic district. George James, a member of an organization of neighbors called New Yorkers for Responsible Development, told the committee that the addition should be setback. William Kahn, another member, said that the design was "too loud from a visual perspective," a "patchwork," "a cacophony of textures with no integrity, no harmony," and was "out of context - a containership on a masonry base." 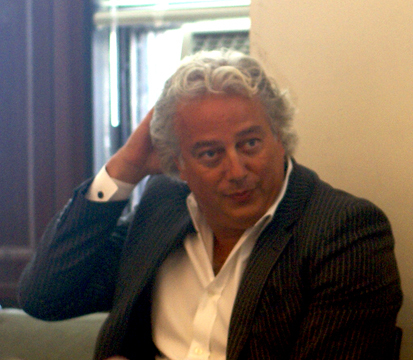 Richard Feigen, the famous art dealer, told the landmarks committee of Board 8 that the design was "a building in bad taste" that was "heavy at the top and light at the bottom." 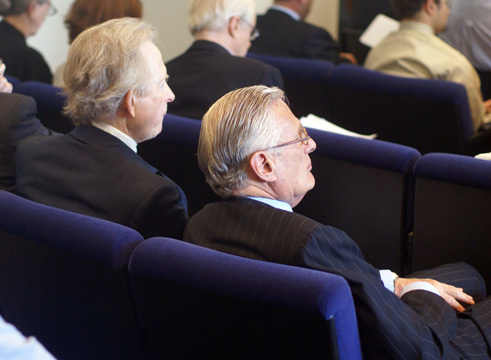 He sat next to Tom Wolfe at the hearing the next day at the Landmarks Preservation Commission. Shahab Karmely, a developer who lives several blocks away from the site, spoke in support of what he described as "a carefully thought-out design." Elizabeth Ashby, president of the Historic Neighborhood Alliance Inc., said that the plan "looks like something that the Martians brought with them when they landed on Madison Avenue, having made a stop in Venice for the cladding." The full board's vote was 32 to 3 in favor of the restoration aspects of the application and 23 to 11 against the addition. Mr. Haw told the commission that this "veil" part of the facade of the addition will add "a mysterious feeling" and would be a "contemporary" addition to the "elegance" of the Upper East Side. The "veil" is a few feet in front of the addition's glazing. Mr. Haw had indicated that a final determination of its color had not yet been made but that it would probably be somewhere "between champagne and terra-cotta." After a detailed presentation by the developer and his team, Pablo E. Vengoechea, vice-chairman of the commission, took public testimony from various civic groups and individuals including Tom Wolfe, the writer, who was not wearing a white suit. Because of the lateness of the meeting, the commissioners did not comment or vote on the application and Mr. Vengoechea said that another meeting will be scheduled "shortly." At the commission's hearing, Mr. Wolfe urged the architect to "come up with something more in keeping with Upper East Side." Many of the speakers indicated they were impressed with many aspects of the plan although they had some reservations. A statement from the Historic Districts Council, said that "The applicant has taken time and considerable thught to create an addition that better rleates to the Parke-Bernet Buidling and the Upper East Side Historic District, something the prior applicaton completed lacked. If this were a new building proposed for a vacant lot, it could be very acceptable," adding that "If it were an addition to a non-landmarked building, it would be an exciting project. Whether it belongs atop a fully designed and constructed building of some acclaim and history in a landmarked district was a matter of much discussion. Some on the committee felt the addition with the accompanying restorative work was appropriate. Others believed that the addition overwhelmed the building, damaged its design and its relationship to the neighboring structures. Still others found the project interesting, but feared it set a dangerous precedent for every low-scale building in an historic distirct to be considered a base for something more." The statement said that many of its members believe that "an addition should be subservient to the original, historic structure," adding that "Knowing that zoning prohibits a set back of this addition, we would recommend taking it down a floor or do" as "Doing so would decrease what some felt was a heavy design suffocating the Parke-Bernet Building." "The committee appreciates the nod to other buildings in the districts with limestone bases and brick upper floors, but we feel the examples do not quite fit here. In such buildings the upper brick portions are all taller than the limestone base, none are split through h emiddle. With this in mind, and, again, in attempt to make the addition less heavy, the committee thought a lighter color would be more appropriate." 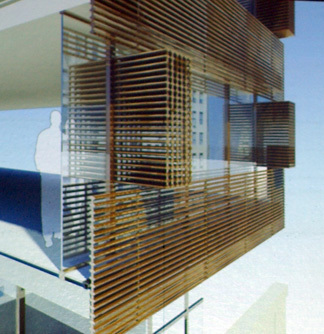 The council also commented on the proposed openable louvers and suggested that they "should fold inward" rather than "tilt out a number of feet from the facade" as proposed. 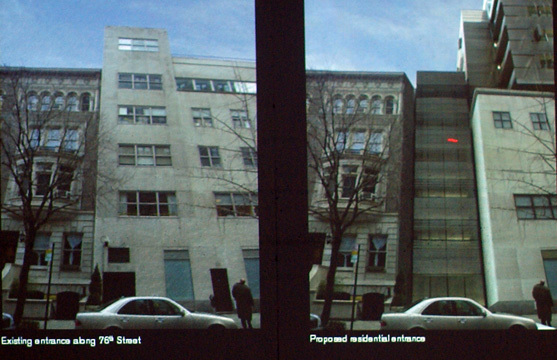 Although, the statement continued, the organization consistently argues for "the smallest rooftop additions on row houses to be minimally visible," "the prevailing sentiment was that with some refinement, this is an opportunity for the Upper East Side to have a world-class building of the 21st Century along with the restoration of the mid-century Parke-Bernet Galleries." A statement from the Municipal Art Society read by Lisa Kersavage, director of advocacy and policy, said that "The proposed addition is a counterpoint to the historic building, and is essentially a 'building placed upon a building.' Yet in terms of scale and massing, it is in equilibrium with the Parke-Bernet Building and lets the historic building 'breathe.' That 'breathing room' is in part provided by the reveal that visually separates the addition. The committee members believe that the façade recess as designed, which is required by the Madison Avenue Special District zoning, diminishes the relationship of the base to the addtion and should be further studied." "The Upper East Side," the statement declared, "has a world-class collection of contemporary architecture that is largely under-recognized. That collection is in part due to the Parke-Bernet Building. When the new auction house for Parke-Bernet opened..., it lured many galleries and arts institutions back to the neighborhood from downtown. 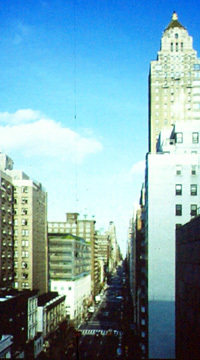 Through the 1950s to the 1970s the Upper East Side was a worldwide center for the arts and new design. 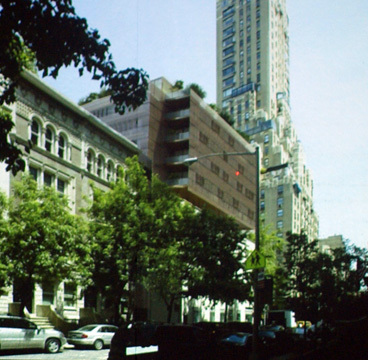 The Guggenheim and Whitney Museums and the now destroyed Hans Hollein-designed Feigen Galleries [on the north side of 79th Street between Fifth and Madison Avenues] are all examples of architecture stemming from the art world, which challenged and provoked yet still responded to the neighborhood's context." "The MAS preservation committee," the statement continued, "had many discussions of this as a total architectural design, and in the end its appropriateness within the district it was found to be acceptably appropriate. Appropriateness is a range, and the committee thinks it does just cross the threshold of appropriateness. We did not come to the conclusion lightly and in no way see that this could be a model for additions on other buildings....One of the fundamental components of making this project appropriate is the extensive restoration of the Pake-Bernet Buidling. The simplicity and elegance of the Parke-Bernet's design has been eroded over the last 50 years by inappropriate additions and alterations. The proposed restoration, including the removal of the 5th story extension, the removal of third story windows and restoration of the limestone will bring back its former dignity." "With some modifications," the MAS statement concluded, "we believe that this proposal meets the exceedingly difficult challenge of providing a large addition that does not subsumethe historic building but respects and enlivens it." A statement from Friends of the Upper East Side Historic Districts said that the new proposal is "a vast improvement" and "we appreciate that the proposed bulk is less than would be permitted under existing zoning." Its statement said that "the prevailing sentiment was that with some refinement, this is an opportunity for the Upper East Side to have a world-class building of the 21st Century along with the restoration of the mid-century Parke-Bernet Galleries. Despite its austerity, Parke-Bernet was and will be a very distinguished, elegant and understated building. If something is going to be built on top of it, it should be elegant and appropriate, separating itself from the orignal Parke-Bernet Building. Foster and Partners achieves this differentiation though materiality and a break in space. The new four-story plus penthouse addition hovers over the old via a recessed base, creating a clear definition between past and present. 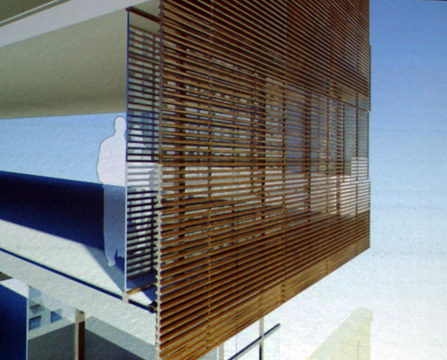 However, we do have questions regarding the interweaving bronze rods that create the skin of the addition. While innovative and richly textured, the bronze colors in the renderings seems rather dark, and appear like a heavy weight compressing the original building....It is our hope that Foster and Partners' addition for 980 Madison avenue will show that hte Upper East Side Historic District can embrace innovation and contemporary architecture.We must care for our old buildings in our beloved historic districts but also allow for appropriate development and innovative design for future generations to admire." Frederick Bell of the New York Chapter of the American Institute of Architects praised the revised design as "a unique and stirking building" and "a worthy project." A spokesman for the New York Landmarks Conservancy said his organization was "generally pleased" with the redesign but had concerns about the bronze "screen." 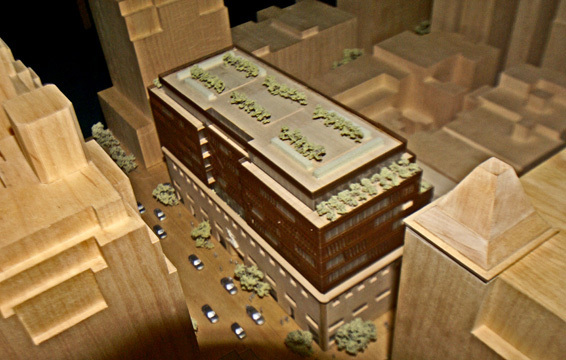 In a June 12, 2008 letter to the commission that was read at the commission's hearing, Peter Pennoyer and Anne Walker argued that "This second attempt by the developer and his architect to seek approval for a new structure atop this building suggests that the Landmarks Preservation Commission should swallow the serious problems this project presents. In fact, this design would inflict much of the same damage as the first proposal." "The addition has no relationship to the scale, materials or spirit of the original Parke-Bernet building. 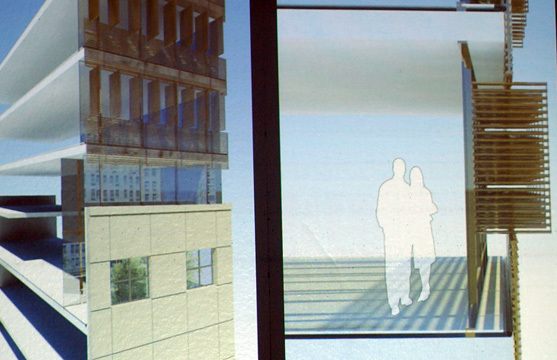 The design has the perfunctory character of a zoning diagram rendered in glass and steel. Like many modern buildings - and 980 Madison is exactly that - this landmark depends on a few critical qualities for its stature: proportion, massing and details. The proposed addition compromises these qualities. "The detail where the addition pulls away from the top of 980 Madison emphasizes the completely foreign character of the Foster design. "As a glass and steel box, the scheme is unsympathetic to Alfred Easton Poor's architecture and a banal nonsequitor in the context of the Upper East Side Historic District. 980 Madison presents a spare and elegant reading of classical proportion. As a relatively low building along Madison Avenue it marks the foreground for some of the taller and more significant hotels and apartment/hotels in the neighborhood, such as the Mark, the Carlyle and 953 Fifth Avenue, designed by I. N Phelps-Stokes. "We note that the addition uses the floor area that would be available as-of-right under the zoning code, but as the Commission has demonstrated in case after case, in this district and others, the criteria of Landmarks designation trump the zoning code. Indeed it would be unprecedented given the record of rejection of even modest roof top additions were this proposal to be endorsed. As a precedent, approval of this addition would establish a basis for many property owners in this district to seek to expand buildings. This expansion would radically transform the character of the neighborhood. Given the Commission's record of painstaking scrutiny of every modification to the architecture of the Upper East Side Historic Districts it would seem blatantly unfair to the many property owners in the area whose applications for modest additions have been denied. 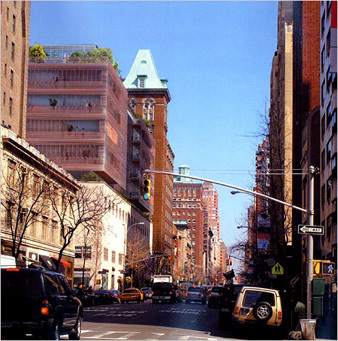 "More important, acceptance of this design would mark a retreat in the protection of this extraordinary part of New York City whose distinct architectural quality is described in the Upper East Side Historic District Designation Report (1981) as follows: As a result of the development patterns on Madison Avenue, the vistas up and down the avenue are characterized by an irregular skyline caused by the combination of tall apartment houses and low rowhouses and commercial buildings. . . . a modular rhythm is maintained that is derived from the basic 20-25 foot width of the rowhouses. This module corresponds to the party walls of the rowhouses and the bay system of the apartment buildings. The storefronts with their variety and the rowhouses and apartment house facades with their greater uniformity and intricate stylistic detail each have their own architectural ambience. Together, they coexist and contribute to the Madison Avenue streetscape. "In 1949, architect William Adams Delano singled out the Parke-Bernet Gallery (Walker & Poor, 1949) as a building that 'combines all the best of traditional and modern schools of architectural thought' and 'demonstrates to others that distinction in commercial building pays.' (William Adams Delano Papers, Yale University). The Upper East Side Historic District Designation Report (1981) described it as a 'significant post-war addition.' Given the building's significance and quality, we hope it won't become a base for Sir Norman Foster's proposed box." The revised Foster design is quite interesting and a major concession to the objections raised by many civic activists and preservationists over the height of tyhe first design, objections that served primarily to protect vistas from the Carlyle and Mark hotels and reflect the very strong and sentiment by such groups in the neighborhood against tall new developments. Such sentiments, however, are unreasonable and the Carlyle and Mark hotels have no legal rights to protected views and the handsome first design was certainly not a supertower that would overwhelm the neighborhood. The basic problem here is with the spirit and interpretation of the "sanctity" of historic districts. Should they be preserved in aspic - this is the Upper East Side after all? Or should one of the most desirable and famous neighborhoods in the world occasionally welcome, on a case-by-case basis, interesting and attractive new additions. Despite the voluminous testimony about the virtues of the existing building as a good example of post-war International Style modernity, the Parke-Bernet Building was not an architectural masterpiece in either its original incarnation or its much modified present condition. (It should be noted, also, that the Hotel Carlyle was a much more important Art Deco style skyscraper in its original incarnation that instantly became the most visible landmark on the Upper East Side skyline, a position it held for many decades even though it was often modified with window carbuncles whose visible scars are unfortunate. Historic districts present many problems. The Greenwich Village Historic District, for example, encompasses more than 4,000 properties, many of which are not pretty 19th Century townhouses. The notion of "context" is important but even most preservationists will concede that not all parking lots and garages and tenement buildings are beautiful and worthy of preservation. The landmarks commission categories buildings within these districts as contributing and "non-contributing." While the former Parke-Bernet Building may be "contributing," its real value is as a low-rise structure that continues the avenue's "high-and-down," hilly topography on the Upper East Side. Some preservationists have protested that the revised design "overwhelms" the existing building while applauding the developer's intention to "fully" restore to it to its original "glory." Given the fact that the "full" restoration is likely to be very expensive, what addition would not "overwhelm" it. 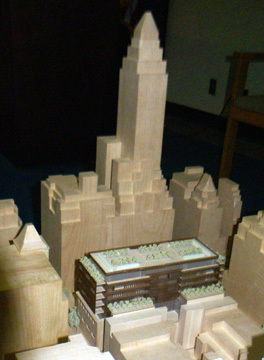 Clearly the first design would be less overwhelming if one were considering only the "sanctity" of the existing building as it would have only been over a small fraction of its roof and furthermore would have been significantly setback from the base to say nothing of providing a major rooftop sculpture garden. Given the remarkable concessions in bulk that the revised design presents, the issue of "overwhelming" comes down primarily to the issues of the addition's color and massing. The model and renderings presented at the Community Board and the commission unfortunately indicated that the addition would be bronze-colored, even though Mr. Haw indicated that a final color has not yet been determined. There are many observers who feel that additions should be clearly indicated as different and that the visual contrast makes for a purer sense of respect for the original building as opposed to a "reproduction." It is an on-going argument that really should only be decided, again, on a case-by-case basis rather than sweeping, district-wide regulations. It could well be argued, however, that a lighter-colored addition, perhaps in stainless steel, might be more palatable than a dark mass. The revised design pays considerable heed to the proportions of the original building and the architect argues that it essential duplicates the proportions of the base, which is true, but certainly not the sole compelling argument for its approval. 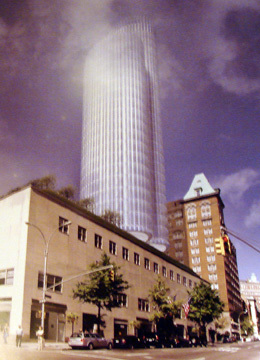 The design does indent the first level of the addition, which has the effect of separating it and "floating" it above the base, an excellent design that recalls the fine indentation at the former C.I.T. building on the west side of Madison Avenue between 59th and 60th Streets. The indented space helps a lot, but perhaps the massing above it could be setback on the east, north and side sides to further mitigate the "overwhelming" problem and perhaps that loss of space would necessitate the addition of another floor, or two. For those who fondly remember watching John Marion conduct the major auctions in the Parke-Bernet Building, the structure holds very fond memories, made even sadder by the decision of Sotheby's, which acquired Parke-Bernet, to relocate to the far less convenient and far less elegant precinct at York Avenue aned 72nd Street. Had Sotheby's not relocated and were to be proposing an expansion at the Madison Avenue site now it would probably not have aroused as much opposition. With some tinkering about the material and color of the louvers and some experimenting with setting back the bulk of the addition somewhat, perhaps 10 feet or so, the new design would essentially be a relatively modest and unobstrusive addition that would pay for the restoration of the existing building. Furthermore, by setting back the addition somewhat concerns about the "chaotic" and "random" opening of the "shutters" would be minimized. Most shutters are kept open but the developer's presentation contained no studies on probably consumer usage, which would be interesting. In any event, now that Santiago Calatrava's "bird" transportation hub at Ground Zero has had its wings clipped and will not have a moveable roof the city deserves an animated building and Foster's "shutters" are very, very elegant appropriately for the Upper East Side.